Do you ever have those nights where you want to cook dinner, but don't feel like going to the grocery store? Or you want to cook, but you left the bag of groceries you bought during your lunch break in your office refrigerator? Or you want to cook, but you're getting ready to move to a new house and want to try to clean out your pantry and refrigerator instead of adding to the mess? Ever had all three in one day? So since I forgot my groceries, didn't want to go back to the store and decided I shouldn't add to the chaos since I'm moving soon, I decided it was time to clean out my freezer. In there was a bag of pre-cooked frozen shrimp. I hardly ever cook with pre-cooked shrimp and I think I only bought this bag for shrimp cocktail. Regardless of the reason, I'm sure I spent over $15 on it and figured I should probably use them instead of letting them go to waste. I realized I had on hand the basic ingredients I use to make crab cakes, so I decided to use the same technique for the shrimp. I threw them in a food processor to grind them up nice and fine, and then mixed them with some ingredients for taste and an egg to bind everything together. I threw them in some oil and presto. Shrimp cakes! 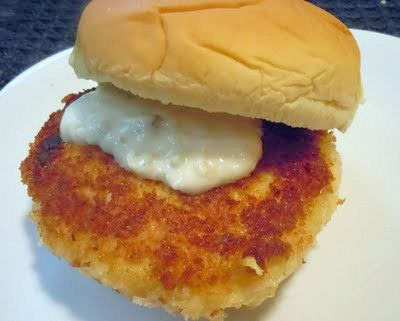 Or for me, a shrimp cake sandwich. Hope you all enjoy! Remove the tails from the shrimp. Add to a food processor and pulse until finely chopped. If you don't have a food processor, you can chop them by hand. Break the bread into small pieces. Add to a medium sized bowl. 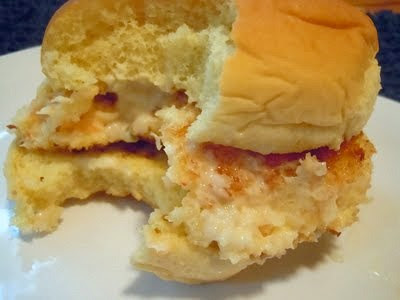 Add shrimp, mayonnaise, mustard, garlic powder, egg, salt, pepper, and lime juice. Stir until well combined. Shape the shrimp mixture into patties (whatever size you desire). Put in the refrigerator for one hour. After an hour, remove the patties from the refrigerator. 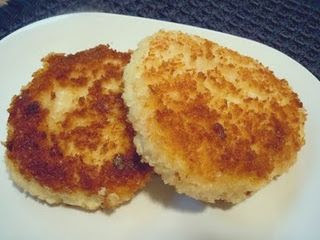 Put the Panko breadcrumbs onto a small plate and dip each patty into the breadcrumbs until well coated. Tap off excess. Heat the oil in a medium sized pan. Add the patties and cook until browned, 2-3 minutes. Flip and cook the other size. Once cooked through, remove from pan. Cook remaining patties. Enjoy! What a great way to use up that shrimp! I'd be putting them on a bun too, I love sandwiches and I love making recipes that clean out my fridge/cupboards! I think it's always difficult coming up with an idea for pre-cooked shrimp. You can't cook them too much or else they'll get rubbery, so luckily this recipe avoided that :) And you can never go wrong with a sandwich!